Expressive and exotic Pantone 18-3224 Radiant Orchid blooms to become the Pantone Colour of the Year for 2014. Radiant Orchid reaches across the colour wheel to intrigue the eye and spark the imagination. From invitation to innovation, Pantone 18-3224 encourages expanded creativity and originality, which is increasingly valued in today’s society. An enchanting harmony of fuchsia, purple and pink undertones, Radiant Orchid is a captivating purple that draws you in with its beguiling charm. Pantone Radiant Orchid’s rosy undertones radiate on the skin, producing a healthy glow when worn by both men and women. A dazzling attention-getter, Radiant Orchid permeated the runways during the spring of 2014 fashion shows. Fashion designers featured in the Pantone Fashion Colour Report Spring 2014, including Jackie Fraser-Swan and Yoana Baraschi incorporated Radiant Orchid into their spring collections. 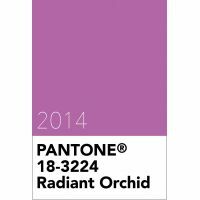 Pantone 18-3224 Radiant Orchid is from the Pantone Fashion, Home + Interiors colour library. Pantone Solid Colours in print: Closest match not available. Pantone CMYK: Closest match not available.